From the Annals of the Border Raids – In 1855, Governor Elisha Pease authorized Captain James Callahan to lead a party of Texas Rangers across the Rio Grande into Mexico purportedly to punish Apaches who were raiding Texas and hiding out in Mexico. It appears more likely that the Callahan Expedition was an attempt to recapture runaway slaves (primarily Black Seminoles) who had escaped to Mexico and obtained permission to settle there. Governor Santiago Vidaurri of Nuevo León y Coahuila had earlier rebuffed a more peaceful attempt by an emissary sent by slave owners and fearing the worst had ordered his troops to prepare for invasion. Callahan crossed into Mexico in early October and engaged the allied Seminole and Mexican forces. A side attack was staged under the command of William R. Henry in an attempt to seize the Black Seminole women and children. But Henry was ambushed and the entire expedition was forced to retreat to Piedras Negras. But there they faced a large contingent of Mexican Regular Army troops supported by the Seminoles. Callahan torched the town in retribution before skedaddling back to Texas with cover from American troops on the north side of the Rio Grande. In 1876 the Claims Commission settled claims originating from the expedition, awarding 150 Mexican citizens a total of $50,000 in damages. This entry was posted in Today in Texas History, Uncategorized and tagged Black Seminole, Callahan Raid, Elisha Pease, James Callahan, Nuevo Leon y Coahuila, Piedras Negras, Texas-Mexico Border on July 5, 2018 by Red from Texas. From the Annals of the Border – In 1915, Luis De la Rosa caused a train crash at Tandy’s Station near Brownsville. 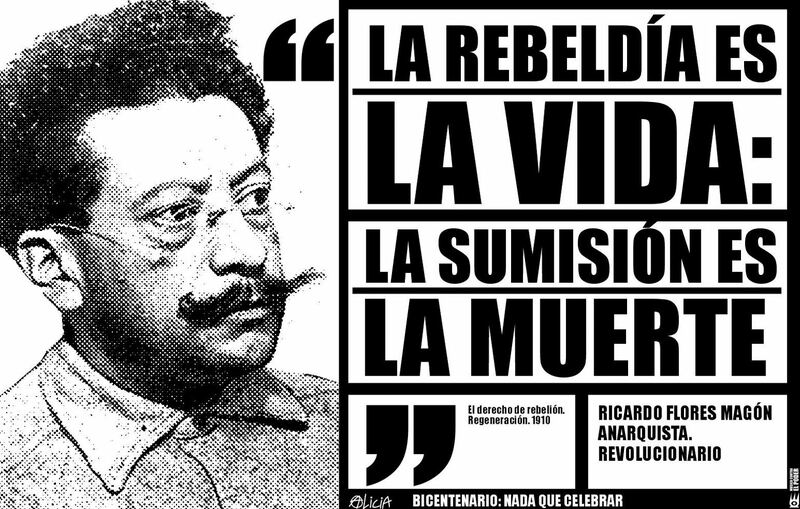 De la Rosa was a revolutionary and follower of the Mexican anarchist Ricardo Flores Magón. The crash was one in a series of several raids by members of the Floresmagonista movement formed by De la Rosa and Aniceto Pizaña. De la Rosa was the driving force behind what was known among Mexicans as the “revolution of Mexicans in Texas.” De la Rosa’s actions were supposedly intended to correct injustices done to Hispanics on both sides of the Rio Grande. He also raised an army of 500 men whose raids and guerrilla fighting on the Mexican border of Texas were connected with the Plan of San Diego, an effort to establish an independent republic in the American Southwest. Image of Ricardo Flores Magon from The Base. This entry was posted in Today in Texas History and tagged Aniceto Pizana, Floresmagonista, Luis De la Rosa, Plan of San Diego, Ricardo Flores Magon, Tandy's Station, Texas-Mexico Border on October 18, 2016 by Red from Texas. From the Annals of the Border – In 1859, Mexican rancher, politician, military commander and at times outlaw Juan Cortina rode into Brownsville with a band of 80 men and seized control of the town. Cortina had a long running feud with the Anglos in south Texas who were attempting to oust him from his family’s extensive holdings on the north side of the Rio Grande in the aftermath of the Mexican-American War. For his efforts, Cortina was viewed as a champion of Mexicans living along the border in the years after the War. The first “Cortina War” arose from an incident on July 13, 1859, when Cortina saw the Brownsville city marshall, Robert Shears, arrest and brutally beat a Mexican who had once been employed by Cortina. Cortina shot the marshall in the shoulder and rode out of town with the prisoner. Early on the morning of September 28, 1859, he rode into Brownsville again, and seized control of the town. Five men, including the city jailer, were shot during the raid. Cortina’s hold on Brownsville was short-lived as residents of Matamoros convinced him to return to Mexico which he did on September 30. This entry was posted in Today in Texas History and tagged Brownsville, Cortina Wars, Juan Cortina, Mexican-American War, Texas History, Texas-Mexico Border on September 28, 2015 by Red from Texas.